For the first time, more than half of all households in the U.S. contain a cellphone but not a landline telephone, according to a new survey from the Centers for Disease Control and Prevention. The growing prevalence of cellphones comes as the typical American household now contains a wide range of connected devices. Some 84% of American households contain at least one smartphone, according to a Pew Research Center survey conducted in fall 2016. Desktop and laptop computers are nearly as common – 80% of households contain at least one of these devices. Tablet computer ownership is somewhat less widespread, with 68% of households containing at least one tablet. And 39% of households contain at least one streaming media device, such as an Apple TV, Roku or Google Chromecast. Many American households have multiple devices – especially smartphones. 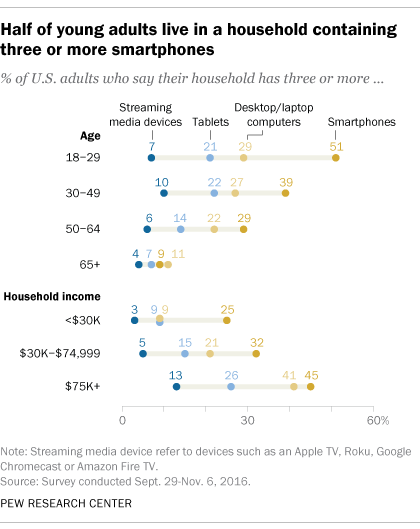 A third of American households have three or more smartphones, compared with 23% that have three or more desktops, 17% that have three or more tablets and only 7% that have three or more streaming media devices. 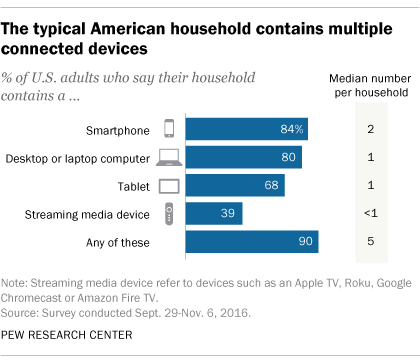 Taken together, 90% of U.S. households contain at least one of these devices (smartphone, desktop/laptop computer, tablet or streaming media device), with the typical (median) American household containing five of them. And nearly one-in-five American households (18%) are “hyper-connected” – meaning they contain 10 or more of these devices. Younger adults and relatively affluent Americans tend to live in households with large numbers of connected devices, and this is especially true when it comes to smartphones. Some 96% of 18- to 29-year-olds live in a household with at least one smartphone, and 51% of young adults indicate that their home contains three or more smartphones. Even so, many older adults also reside in households with multiple mobile devices. Nearly four-in-ten 30- to 49-year-olds (39%) and 29% of 50- to 64-year-olds say their home contains three or more smartphones. In total, the typical (median) 18- to 29-year-old lives in a household with six of these connected devices – a figure that is comparable to the median figure among those ages 30-49 (six) and 50-64 (five). Higher-income Americans are about twice as likely as those who are lower income to say their household has three or more smartphones (45% vs. 25%). But affluent Americans also stand out in comparison with lower-income households when it comes to traditional computers and tablets. Four-in-ten Americans with an annual household income of $75,000 or more (41%) say they have three or more computers in their home, compared with 9% of those whose household income is $30,000 or less. And 26% of these higher-income Americans say their home contains three or more tablets, compared with 9% of those earning $30,000 a year or less. Note: View full topline results and methodology (PDF).